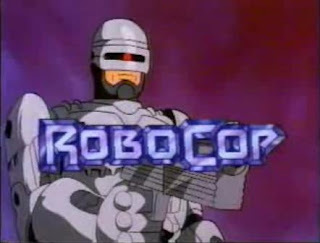 Hey, remember that awesome Robocop movie from 1987? A movie so violent that it was almost granted an X rating? Yeah, we all love that movie for good reason! It was a perfect blend of scifi, horror, violence and comedy. Peter Weller played that role so perfectly, you actually believed he was more robot than man. It's such a great movie and it still holds up! Yes, it was such a great movie, someone decided to take an almost X-Rated action movie and turn it into a kid friendly cartoon, which seemed to be commonplace at that time, a year later from Marvel Productions, one of the two companies that produced cartoons like Transformers, GI Joe and Jem. Confession: even as a kid, I simply could not get into this cartoon. I watched the cartoon around the same time the actual movie hit VHS so it was too drastic of a change even at age 5 for me to accept. What can I say? Even then I was demanding of my cartoons. Now, of course being the 80s, you can't have a cartoon without toys and comics. So, Marvel covered the comics side and the toys? Who else but Kenner to deliver the chrome plated goods? 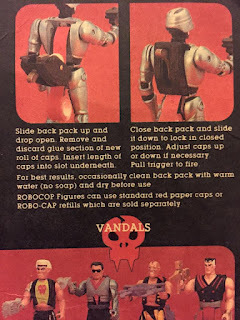 The line was released in 1988 as "Robocop And The Ultra Police", a chrome painted extravanagazna of heroes who looked like they were extras in a Cannon Films production of Robocop and villains called "The Vandals" who looked so much like the Dreadknocks from GI Joe, you would've thought Hasbro's lawyers would be waiting first thing Monday morning at Kenner's door. Most of the characters were created for the animated series. I had a few of the figures at that time. 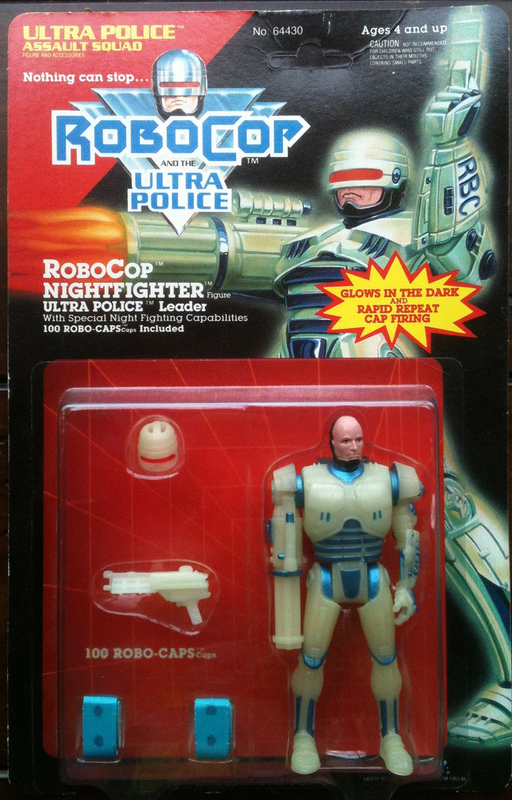 Robocop himself, obviously, followed by his Hardees colored colleague, Birdman Barnes. 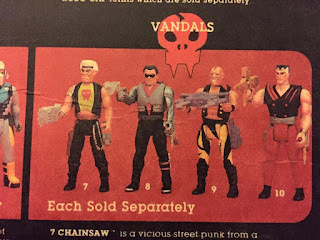 Never had any of the Vandals themselves, although I feel like one ended up in my collection later. But my favorite piece? ED-209. Oh yes. 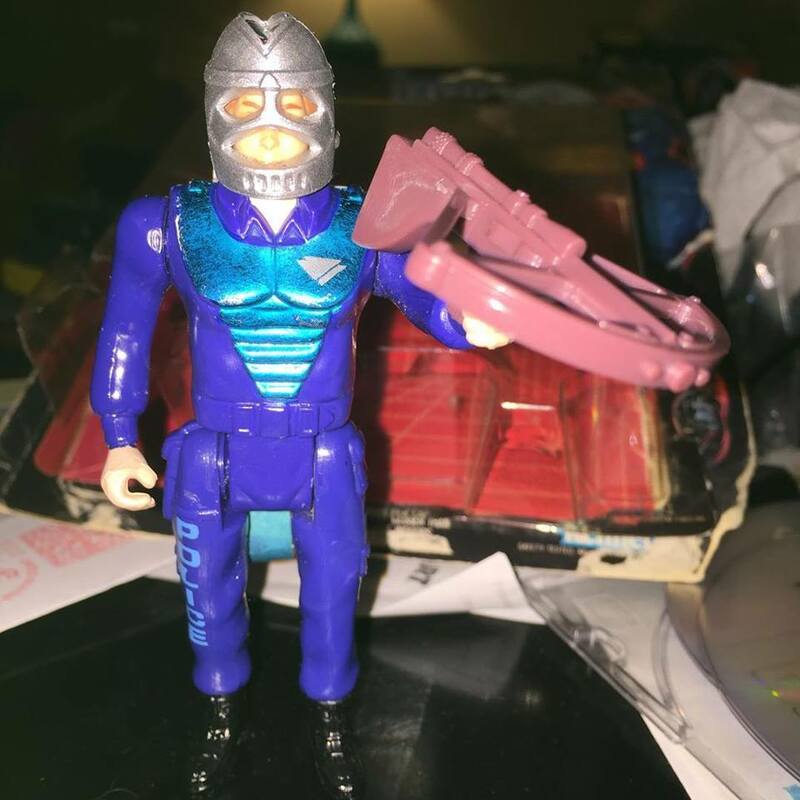 You can't have that toy line without having the most toy looking character in the whole movie! It was meant to be! 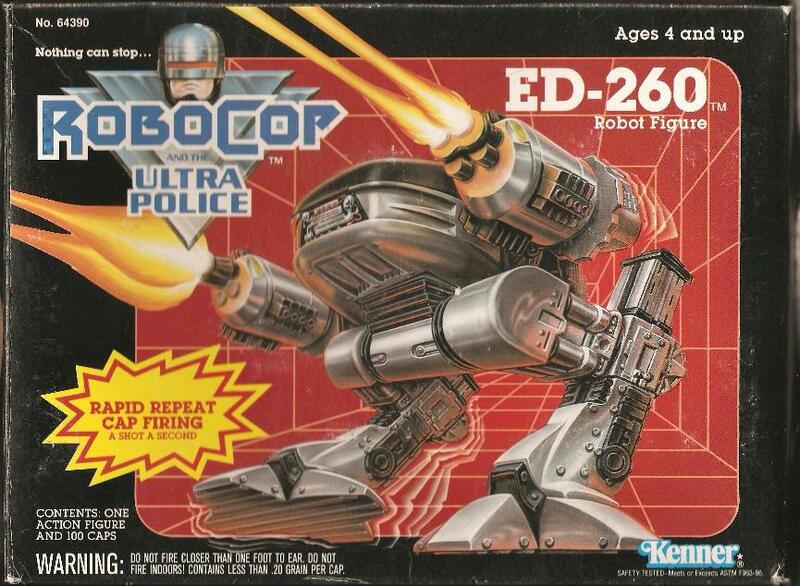 Obviously we'd get a bigger and more intricate ED209 later but this one was just too great to pass up as a kid. And just like the rest of the line, you cut put caps in his back and fire away! As dangerous as it may appea rnow, this was a fun gimmick back then. Usually reserved for cheap cap guns you'd get at the dollar store. 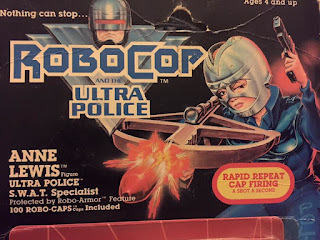 For this toy line, it made sense, considering how violent and gun-centric the Robocop universe is. It was an extra charm that made this line standout. Because, quite frankly, the sculpts didn't help. They were just too bland. Don't believe me? Yeah. That's supposed to be Anne Lewis. VERRRRRRRY big difference than the source material. Like. Yikes. I can't imagine Nancy Allen was too flattered by this figure. Probably my favorite figure out of the entire line was a figure I didn't even have or have even seen in person. 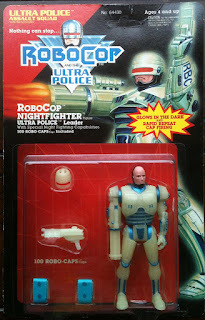 The Nightfighter Robocop was initially offered as a mailaway. Mailaway's were the "convention exclusives" of it's day and a favorite of kids everywhere. Sadly, the 6-8 week wait for mailaways were downright brutal but it was worth it. It was owning a toy that very few others had. You pretty much owned the playground when it came to bringing action figures to school. And of course this figure was pretty downright phenomenal. In fact, he was so phenomenal, Kenner decided to release it in stores. 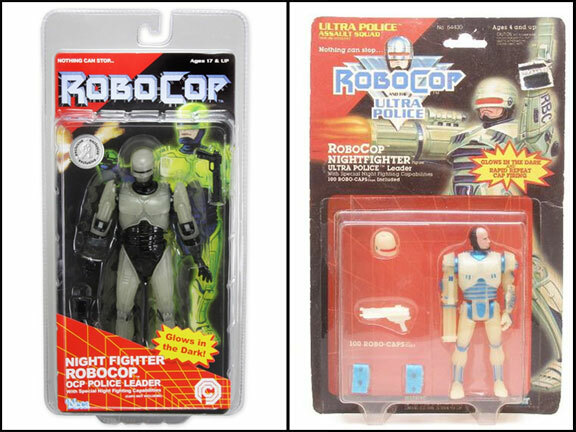 So, while kids who salivated over the idea of joining the exclusive club by owning a glow in the dark Robocop, they were then disappointed to find out that it was being offered in the mainstream. 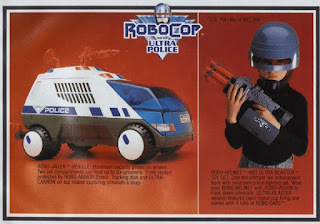 Robocop and the Ultra Police wouldn't be Alex Murphy's one and only shot at toy-fame. In 1993, a small toy company called Toy Island, who offered lower end and cheaper toys produced a toy line in conjunction with a new Robocop tv series. 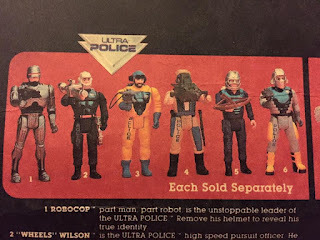 The line was somewhat similar to the Ultra Police, consisting of random characters created for the tv show, including a character portrayed by Roddy Piper, Commander Cash. 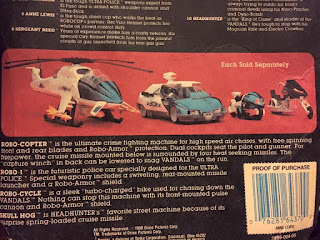 Accessories, vehicles, and even a large talking figure. The line was pretty modest but didn't really take off. A few years later, another animated series, this time called "Alpha Commando" hit the airwaves creating another opportunity for Toy Island to offer more toys. It was a little more successful, but the cartoon lasted one season and therefore the toys ended. Shame. Robocop and the Ultra Police was a fantastic toy line and one of my fondest memories of my childhood. I just loved these figures. They're very collectible and still fun to hear the caps go off! "Now, of course being the 80s, you can't have a cartoon without toys and comics." 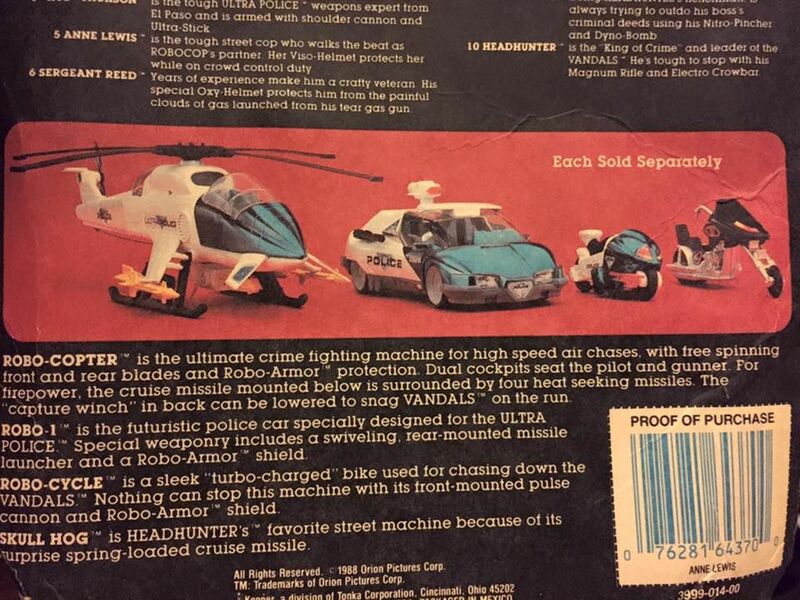 Let me fix that for you: Now, of course, being the 80s, you can't have a *toy* without cartoons and comics. 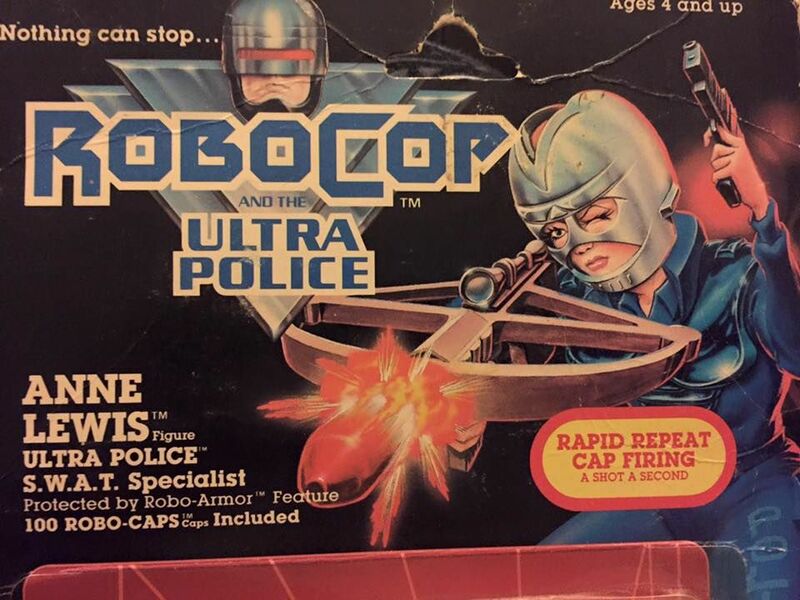 Robocop, Masters of the Universe, and everything else had cartoons to promote the toys, not vice-versa. That was a direct result of the FCC changing its prior rules to allow children's cartoons to be based on toys as long as the cartoon had some kind of purported educational value. BTW, I love your blog and this article, so please pardon the nit-picky thing. Those damn things were dangerous. 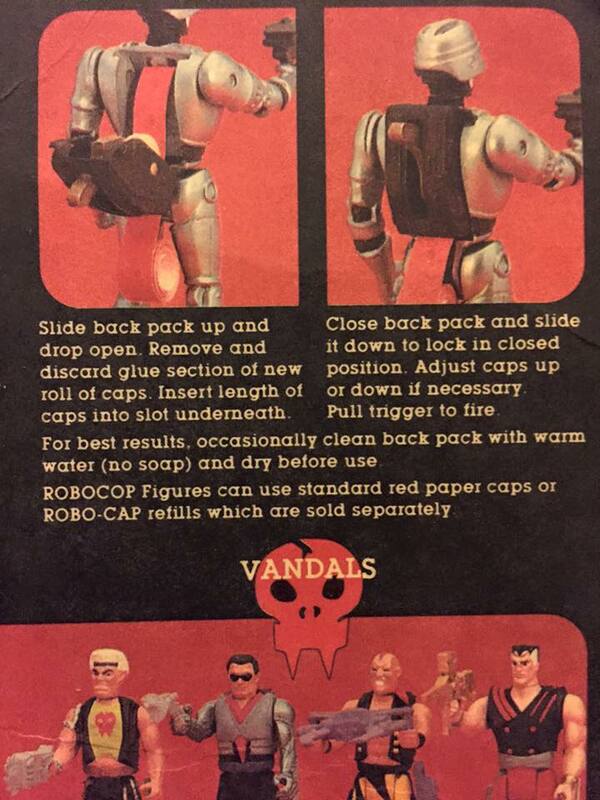 All is well and good until your Robocop caps lit on fire (thankfully it didn't burn me or anything else).